We’d love your help. 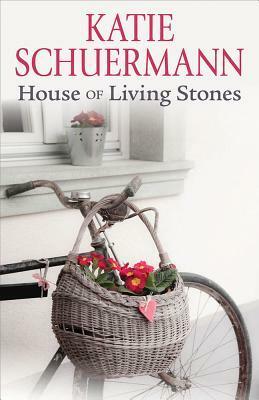 Let us know what’s wrong with this preview of House of Living Stones by Katie Schuermann. In the small Illinois town of Bradbury, change doesn't come often, and it certainly doesn't come easily. So when Pastor Fletcher hires Emily Duke as the new choir director at Zion Lutheran Church, he unknowingly sets in motion a chain of events that turns the life of his congregation upside down. The crusty church secretary, Mrs. The first book in the Anthems of Zion series! The crusty church secretary, Mrs. Scheinberg, must learn to adjust her curmudgeonly ways. Zion's talented but pompous organist, Evan Ebner, must recognize his shortcomings. Emily must come to terms with her past. Even Pastor Fletcher must face reality when his world is shaken by the baggage Emily brings and by the handsome Zachary Brandt who pursues her. To ask other readers questions about House of Living Stones, please sign up. Once I entered the world of Emily Duke, I could not seem to put it down again for very long. Charming, sweet, and wholesome, yes, but oh so much more. This book switched between humor and sorrow with grace and ease. It was real in a way that never felt forced or contrived. Life lessons and faith lessons wrapped in honesty and warm hugs. I wanted to crawl inside its pages and spend time with these people, that's how they real they felt. Sure, it was easy to fall in love with Emily, Alice, Pastor Once I entered the world of Emily Duke, I could not seem to put it down again for very long. Charming, sweet, and wholesome, yes, but oh so much more. This book switched between humor and sorrow with grace and ease. It was real in a way that never felt forced or contrived. Life lessons and faith lessons wrapped in honesty and warm hugs. I wanted to crawl inside its pages and spend time with these people, that's how they real they felt. Sure, it was easy to fall in love with Emily, Alice, Pastor Fletcher, just as easy as it was to shudder by appearances from Evan, Candice, and Geraldine. But the thing about the latter characters isn't that they were the typical villains of a story, but that they possessed flaws that are easy to dislike in ourselves, and there's always so much to learn from characters like that. Fear of letting people too close after being hurt. Passing judgments without ever seeking the truth. Whispering in ways meant to hurt another, talking too much when we would be better served by listening. Clinging to resentment and anger, allowing it to turn us bitter and then unleashing that unhappiness onto others. Harsh criticism. Pride. Jealousy. Hypocrisy. Self-righteousness. It's not so easy to like characters that reflect back to us qualities we don't much care to acknowledge in ourselves. This book -- the characters and their stories -- was what my soul was craving, and I didn't even know it, despite the fact that I'd been looking forward to cracking open this book for quite some time. I've never lived in a town as small as Bradbury, Illinois, but I've attended a small Lutheran church. House of Living Stones was so spot on in capturing a small LCMS church that I couldn't help but feel as though I'd been there, somehow, before. Having been Lutheran my entire life, I can't speak for how many of the nuances would appeal to (or maybe even be noticed by) readers of other Christian traditions, but even so, there's so much good quality reading to be done here, that I feel confident just about anyone who enjoys Christian fiction would like what they find. This is a sweet, fun, sometimes thought-provoking look at life in a small town. I laughed many times while reading this, and got tears in my eyes a couple times too. Schuermann has written two sequels, and I hope to read them before the end of the year. I've seen this book compared to the Mitford books by Jan Karon, and that description is fairly apt, though I feel like this is a bit edgier than the Mitford books I've read. But the first Mitford books were written more than twenty years ago, so, This is a sweet, fun, sometimes thought-provoking look at life in a small town. I laughed many times while reading this, and got tears in my eyes a couple times too. Schuermann has written two sequels, and I hope to read them before the end of the year. I've seen this book compared to the Mitford books by Jan Karon, and that description is fairly apt, though I feel like this is a bit edgier than the Mitford books I've read. But the first Mitford books were written more than twenty years ago, so, you know, whatever. By "edgier" I just mean there's a character that others suspect of being gay (he isn't), and there are some downright unpleasant people here. Plus very gossipy ones. So much gossip. Which is portrayed as being bad and wrong, at least. Zion Lutheran Church in Bradbury, meet Emily Duke. She is kind, thoughtful, and ready for a new beginning. Emily Duke, meet Zion Lutheran Church in Bradbury. Her members are sharp, practical, and fiercely loyal. Together, they learn that life is always sweeter when burdens- and cinnamon rolls- are shared together. This book has a special place in my heart. Initially read during a very difficult time in my life, House of Living Stones made me laugh, cry, and most importantly, gave me HOPE. Katie S Zion Lutheran Church in Bradbury, meet Emily Duke. She is kind, thoughtful, and ready for a new beginning. Emily Duke, meet Zion Lutheran Church in Bradbury. Her members are sharp, practical, and fiercely loyal. Together, they learn that life is always sweeter when burdens- and cinnamon rolls- are shared together. Really enjoyed this book. Can't wait to read more from this author about the people at Zion and their lives. Delightfully hard to put down, and it made me want to go read Anne of Green Gables again. The crusty church secretary, Mrs. Scheinberg, must learn to adjust her curmudgeonly ways. Zion's talented but pompous organist, Evan Ebner, must recognize his shortcomings. Emily must come to terms with In the small Illinois town of Bradbury, change doesn't come often, and it certainly doesn't come easily. So when Pastor Fletcher hires Emily Duke as the new choir director at Zion Lutheran Church, he unknowingly sets in motion a chain of events that turns the life of his congregation upside down. -- My thoughts-- This book was so amazing I quickly fell in love with this cast of quirky characters. From the grouchy Mrs. Sheinberg, which I think is my favorite, to the lovable Emily and even Evan. You will love to hate Candice and Geraldine, but it does take all types and they are all in our churches. We might even see a bit in ourselves. Katie was compared to Jan Karon, but I disagree. I think it was much better. Not so many characters introduced, and a storyline I can follow that didn't get so crazy. Many times I couldn't get over how amazingly good and rich this book was with characters and descriptions. Written so well, I read it in one setting. I really loved when it said that he held onto grudges like they were treasures. Isn't that the truth. That really hit home. Don't we tend to do that? This book is so truth and scripture based, as well as lots of songs in it, I found myself singing along. The women of the church seem determined to find a match for their young, bachelor pastor, so the young, single female choir director is enthusiastically welcomed... except by the organist and interim director. But then the rumor mill starts, as some supposedly Christian parishioners reveal smug self-righteousness and a desire to humiliate while others reveal a soft, caring heart hidden behind a prickly exterior, reminding us all that appearances are less important than heart. Showing the difficul The women of the church seem determined to find a match for their young, bachelor pastor, so the young, single female choir director is enthusiastically welcomed... except by the organist and interim director. But then the rumor mill starts, as some supposedly Christian parishioners reveal smug self-righteousness and a desire to humiliate while others reveal a soft, caring heart hidden behind a prickly exterior, reminding us all that appearances are less important than heart. Showing the difficulties of change within any established church, and especially when people are older and set in their ways, and the perils of gossip and speculation, the revelations when they open themselves to new possibilities are encouraging. Anyone who's worked behind the scenes will appreciate the personality conflicts and various resolutions! With a love of God, the church, music and books shining through, fans of Mitford may also enjoy this; Jan Karon's series is a little lighter, but with a similar feel. Katie Schuermann's writing is descriptive and encompassing, but with a light touch revealing a heart of fun. (The bulletin errors were particularly entertaining.) There's sorrow and laughter, sharing and giving, and a couple of Anne moments that remind me it's time to reread an old favorite! I was happy to discover this is the first in a new series, and look forward to reading more! This novel is absolutely hilarious and refreshing!! I found myself laughing through parts and then crying! I was a former pastor's wife and Katie has captured the antics of mannerisms of church life in such an amusing and tasteful way. I fell in love with Emily, Alice, Rebecca, and Pastor Fletcher while feeling equal amounts of distaste for Candice and Evan. Before the story had come to a close, many of my feelings had changed about characters and assumptions. I felt for Emily trying to take ove This novel is absolutely hilarious and refreshing!! I found myself laughing through parts and then crying! I was a former pastor's wife and Katie has captured the antics of mannerisms of church life in such an amusing and tasteful way. I fell in love with Emily, Alice, Rebecca, and Pastor Fletcher while feeling equal amounts of distaste for Candice and Evan. Before the story had come to a close, many of my feelings had changed about characters and assumptions. I felt for Emily trying to take over a church choir in a long-established church with an equally well-established choir membership. New pastors in churches experience many of the same things......change one thing at a time, don't change too much, as there are always many opinions and thoughts on matters of the church and choir. I love how this book shows that people can change, people can make unfounded assumptions and there is always someone or a few someones who like to spread gossip in the church. It can tear churches apart if allowed to fester and grow. I really appreciate the way young Pastor Fletcher handled the problem of gossiping in the church. Music lovers will surely appreciate the many references to musical instruments, singing, and choirs. I highly recommend this book to readers and rate it 5 stars. I loved both of her books. I actually read them twice. A friend read them and said she was tempted to switch to becoming a Lutheran. These books are wonderful. they make you laugh, cry, learn about God's grace and mercy. I certainly hope she comes out with many more books. I really enjoyed this book. I haven't read Christian fiction in years because I got tired of the perfect characters. The characters in this book and real and relatable: simul justus et peccator. I am looking forward to the next book in the series. A delightful book that gives you a peak into the lives of members of Zion Lutheran Church. Flawed, hurting but also loving people who have a history together. I can't wait for the next one. LOVED this book. Could have been written by Jan Karon or Jeanette Oke. Or maybe Debbie Viguie. The living stones are the people who are the church, the different personalities that make up this congregation of a small Lutheran church in a small town. You don't have to be Lutheran, or even a Bible-thumping Christian to appreciate this story of a choir director who moves to the town and faces the mystery of why the organist is so ornery, what's going on with various people... and of course there i LOVED this book. Could have been written by Jan Karon or Jeanette Oke. Or maybe Debbie Viguie. The living stones are the people who are the church, the different personalities that make up this congregation of a small Lutheran church in a small town. You don't have to be Lutheran, or even a Bible-thumping Christian to appreciate this story of a choir director who moves to the town and faces the mystery of why the organist is so ornery, what's going on with various people... and of course there is the fact that she's an attractive youngish woman, so that sparks some interest. I liked this book much more than I had expected. Normally the small-town church life genre is not my cup of tea, but after starting the first chapter one night when I couldn’t stand cramming any more dry nonfiction in my brain, I found myself drawn in, squeezing chapters in during lunch and late at night. It was a bit of a guilty pleasure and the perfect summer fun read. How could I help liking an almost flawless heroine who loves bunnies and Anne of Green Gables? Not to mention chocolate and mus I liked this book much more than I had expected. Normally the small-town church life genre is not my cup of tea, but after starting the first chapter one night when I couldn’t stand cramming any more dry nonfiction in my brain, I found myself drawn in, squeezing chapters in during lunch and late at night. It was a bit of a guilty pleasure and the perfect summer fun read. How could I help liking an almost flawless heroine who loves bunnies and Anne of Green Gables? Not to mention chocolate and music and young, handsome, single, intelligent, theologically-sound, Lutheran pastors. SO . . . the characters may be more than a tad stereotypical, but I still loved them in the same sort of warm, exuberant way that I (and Emily Duke!) love Anne Shirley. Reading about them was cozy and satisfying. And, to her credit, Mrs. Shuermann does try to round her characters with a combination of flaws and admirable traits and peculiar quirks. They are loveable even while remaining undeniably fictional versions of the people all churches know. One was the overly-wrought metaphors and descriptions that appeared predictably in the first few paragraphs of every chapter and sometimes elsewhere. I have sympathy for this flaw, being prone to embrace such elaborate circumlocutions myself, but they were so frequent and so obvious that I had a hard time appreciating the freshness they might have presented in a subtler form. The other distraction was the sort of “product placement” for all things Lutheran. I would be reading along, not consciously aware of the dialogue and narrative because they were quite natural, and then suddenly I was pulled out of my enjoyment by the mention not of someone looking in “the hymnal” but rather flipping through the pages of “Divine Service setting three in the Lutheran Service Book.” Why not mention that it’s on page 184 while we’re at it? Even whole scenes sometimes felt inserted to showcase portions of the Catechism or to provide commentary on hymnody or doctrine. I wish these could have seemed natural to the story, but they didn’t. I felt like Anne Shirley discovering that her dear friend had “helped” her by taking her beloved short story and simply inserting a few lines so the heroine could advertise what brand of baking powder she had used to make her cake. Despite all this, I enjoyed the book. Reading it was as friendly and fun as eating apple cake straight out of the pan. Surprisingly this was a fun read and would give it 3.5 stars. There is quite abit of humor and I actually teared up at one point. If you belong to a church or any organization really, you will be able to put names to these characters. A good book to show how we sometimes treat each other and how we should. House of Living Stones has become for me a comfort read. Even more so than other books that are easy to pick up when you need something warm and familiar, HoLS brings with it the sweet words of the Gospel, the truest comfort of all. I love this series. Plus, the book's title comes from a rock solid hymn. Can't go wrong there. This is a great piece of contemporary writing. The author balances humor with heartache, joy with sorrow, laughter with longing. The result is a compelling and completely believable story that leaves the reader anxious for more! This book is light reading, but definitely not fluff. Looking forward to the next volumes. I just re-read this novel as part of my vacationing and I found myself laughing at the Lutheran in-jokes here and there. Schuermann has accurately depicted life in a choir and in a congregation, and given us characters who are very much true-to-life. I enjoyed this novel a lot. I will read it again. And again. The book reminded me of the Jan Karon series. I enjoyed the characters. It was funny and kept me interested. I can't wait to read the next book in the series. Since I'm Lutheran, there were some little nuances that I appreciated in this cute romance novel from Katie Schuermann. I'm looking forward to reading her next book! I simply adored this delightful book. It truly captured the essence of Lutheran church life in the Midwest. When Emily Duke becomes Zion Lutheran 's new choir director, her presence sets in motion a whole host of cataclysmic events that will change the church and community forever, not to mention the single pastor! It's a wonderful addition to my library, and I can hardly wait to read the sequel. With gentle humor, heart, and characters you swear you've met before in real life, a great start to a series! This is good Christian fiction for anyone, but especially for those whose lives revolve around their local church and community. It's not afraid of showing the warts, the scars, and the power of forgiveness. I look forward to finishing the whole series soon. Some like to call this book, "The House of the Living Stones" but those dear ones are mistaken. The solution is simple, though. Omit the word "the" twice and now you've got it exactly right! Since reading this book (House of Living Stones, mind you) myself and loving it, I've bought more copies as gifts for several friends. All of them have said how much they enjoyed reading it, too! The story-telling isn't *just* entertaining (though it's definitely that!) but it also teaches important truths a Some like to call this book, "The House of the Living Stones" but those dear ones are mistaken. The solution is simple, though. Omit the word "the" twice and now you've got it exactly right! Since reading this book (House of Living Stones, mind you) myself and loving it, I've bought more copies as gifts for several friends. All of them have said how much they enjoyed reading it, too! The story-telling isn't *just* entertaining (though it's definitely that!) but it also teaches important truths about life together in the family of God. I enjoyed this book a lot. It had a fun story line with laugh out loud moments. I can’t wait to read the next book in the series. I loved this book. I plan on reading the other 2 books she has written! This is a light, at times funny read. It reminds me a lot of Jan Karon's Mitford series. Takes me to a time and place where I can rename the characters to people I know in the flesh. She writes with such a fresh perspective and clear characters that you can't help but fall in love with because they are all so familiar. What a wonderful story about a small town with a strong Lutheran church. Even if you're not Lutheran I can guess you'd find yourself shaking your head because you would be able to recognize some of the characters from your own church. Earthy and lyrical, Katie Schuermann's voice is as refreshing and invigorating as the Midwestern sunshine in which she was raised. Writing in vignettes which so perfectly suit the charm of small-town life, Schuermann's words call to mind the warmth and realism of Montgomery's Avonlea and Herriot's Yorkshire countryside. Always leaning toward the arts, Schuermann earned graduate degrees in music. No Earthy and lyrical, Katie Schuermann's voice is as refreshing and invigorating as the Midwestern sunshine in which she was raised. Writing in vignettes which so perfectly suit the charm of small-town life, Schuermann's words call to mind the warmth and realism of Montgomery's Avonlea and Herriot's Yorkshire countryside. Always leaning toward the arts, Schuermann earned graduate degrees in music. No doubt, her cornfield roots and curriculum vitae factor heavily in her stories, but it is her confession of faith in the Triune God that readers have come to expect and trust in her writing.